Sharon Olds is the author of eight volumes of poetry. Her poetry, says Michael Ondaatje, is “pure fire in the hands,” and David Leavitt in the Voice Literary Supplement describes her work as “remarkable for its candor, its eroticism, and its power to move.” With sensuality, humor, sprung rhythm, and stunning imagery, she expresses truths about domestic and political violence, sexuality, family relationships, love, and the body. Often compared to “confessional” poets, she has been much praised for the courage, emotional power, and extraordinary physicality of her work. 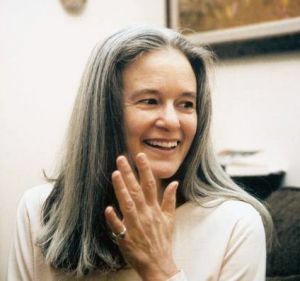 A reviewer for The New York Times hailed her poetry for its vision: “Like Whitman, Ms. Olds sings the body in celebration of a power stronger than political oppression.” Born in San Francisco, Sharon Olds studied at Stanford University and Columbia University. Her numerous honors include a National Endowment for the Arts grant; a Guggenheim Foundation Fellowship; the San Francisco Poetry Center Award for her first collection, Satan Says (1980); and the Lamont Poetry Selection and the National Book Critics’ Circle Award for The Dead and the Living (1983). Her other books of poetry are Strike Sparks: Selected Poems 1980-2002 (2004), Blood, Tin, Straw (1999), The Wellspring (1995), The Father (1992), and The Gold Cell (1987). Her poetry has appeared in The New Yorker, The Paris Review, Poetry, The Atlantic Monthly, and The New York Times. Named New York State Poet Laureate (1998 – 2000), Olds teaches graduate poetry workshops at New York University as well as the writing workshop she helped found at a 900-bed state hospital for the severely disabled. She is a Chancellor of the Academy of American Poets and a member of the American Academy of Arts and Science. One Secret Thing (2008) was a finalist for the T. S. Eliot Prize and the Forward Prize. Her next collection, Stag’s Leap, will be released in Sept. 2012. She lives in New York City.